My earliest memory of reading Archie comics was in the 1960’s when I would go to visit my grandparents. They didn’t have much to entertain a child except for five old comic books, three of them Archie‘s (the other two were Disney characters). It was those same comics every time I’d visit, so probably for ten years I’d read those same comics over and over during long weekends. As I got older I’d pick up an issue of an Archie come every now and then simply because they’d become old friends. What I didn’t realize was that these titles have been around for a LONG time. This collection features thirty different stories culled from the pages of Archie comics, all from 1944. Dark Horse Comics and their editors have done some tremendous research to give us the names of the authors and artists for most of these reprinted stories (most, but not all). It was not traditional to print the authors and artists names in these old comics, so to come up with any at all is remarkable. One of the best parts about these reprinted stories is that while they definitely show their age in the way they treat women and how they constantly hawk their support of servicemen and the buying of war bonds, they are also timeless. We can still get a chuckle at how Archie can’t seem to get out of trouble or how out of fashion Mr. Weatherbee was. While there’s a strong component of nostalgia to reading these (no … I didn’t read these in the 40’s), there is also a sense of social studies happening here. We can get a look at popular entertainment from the time period. For me, this was just fun. It’s good to read a graphic novel/comics that isn’t all about superheroes or YA angst. Looking for a good book? 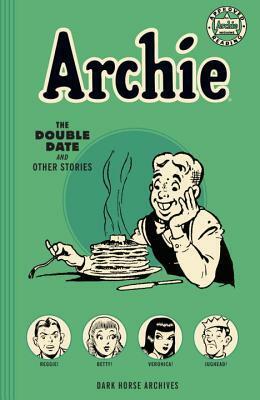 Archie Archives: The Double Date and Other Stories is a throwback graphic novel that reminds us that Archie and friends weren’t always the brooding characters we see on today’s Riverdale series.